This plush over sized reclining chair will be a cozy and stylish addition to your living room. The ultra sofa high back cushion and deep seat cushion will keep you comfortable as you recline. 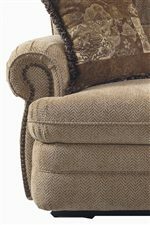 Welts and flared arms with nail head trim are distinctive touches that make this recliner special. Throw pillows are the perfect finishing touch. This recliner is available in multiple fabrics and leathers by special order, so you are sure to find the ideal fit for your home and your unique style. The Hancock Snuggler Recliner by Lane at AHFA in the area. Product availability may vary. Contact us for the most current availability on this product. The Hancock collection will help you create a stylish and comfortable living space for you and your family to enjoy. The reclining pieces are easy to use, with exterior handles that allow you to sit back and relax. 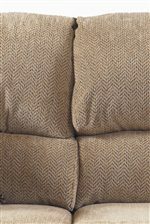 Plush high back cushions and deep box seat cushions are cozy, framed by attractive flared arms with welts and classic nail head trim. These pieces are available in multiple fabrics and leathers by special order, so you are sure to find the perfect fit for your home. The Hancock collection is a great option if you are looking for Casual furniture in the area. Browse other items in the Hancock collection from AHFA in the area.